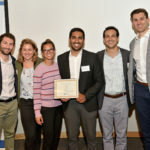 BruxA aims to improve the treatment of sleep bruxism by providing a smart night guard and mobile application to track nighttime teeth grinding. EvalueMe is enterprise SaaS that uses Artificial Intelligence to coach employees on writing meaningful, actionable, and unbiased performance reviews. Neighborhood Works is an affordable real estate development company that builds permanent supportive housing to combat LA’s homeless crisis. Learn more about all the teams that participated in the Final Round. 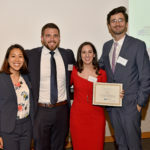 The $100,000 Lowell Milken Institute-Sandler Prize for New Entrepreneurs is a team business plan competition designed to recognize student innovation and support the real-world launch of promising new business ventures. 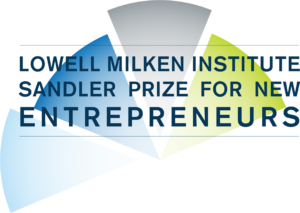 Offering the largest entrepreneurship competition award of any law school with a total of $100,000 in prizes, the Lowell Milken Institute-Sandler Prize for New Entrepreneurs is open exclusively to UCLA students. This competition is for teams with a Startup Business that the team has already started to build or intends to build within the next 12 months. A Startup Business is any proposed business or existing business, for profit, not-for profit, or public benefit. The Startup Business must be a new, independent venture in seed or startup stages. 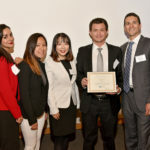 Each team must consist of two to six members and include a current UCLA School of Law 3L or LLM in good standing, or a 2018 UCLA School of Law graduate. Finalists are invited to present their venture idea at the public Final Round event where winners are determined by our Final Round judges. Stay updated on the 2018-2019 competition and competition-related events! Registration for the 2018-19 competition has closed. Read through the competition details and rules. Each team must have an eligible UCLA School of Law student. Attend our Meetup events to connect with potential team members. Register to create a job posting or view available positions. Once you have a team, submit an application! Business Plans are due Friday, March 22. Read through the submission instructions. Don’t forget to include a submission form with your business plan! Have questions? Read through our FAQ or contact us. Students taking part in the competition may avail themselves of these UCLA Resources. Open to the UCLA Community and invited guests.